St. Francis Herb Farm Lemon Balm VegiCaps are traditionally used in Herbal Medicine as a sleep aid (in cases of restlessness or insomnia due to mental stress) and to help relieve digestive disturbances such as dyspepsia. 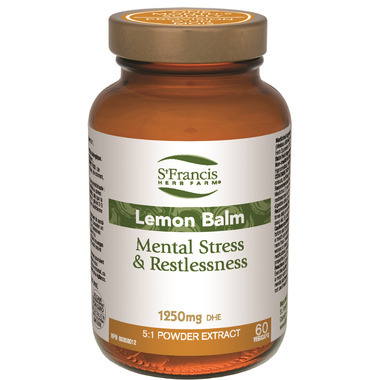 St. Francis Herb Farm Lemon Balm VegiCaps offers the convenience of capsules coupled with greater potency than is found in other capsules. Medicinal Ingredients (per capsule): Lemon Balm (Melissa officinalis, herb top) 250 mg (5:1 extract, Dried Herb Equivalent 1250 mg). Directions: Adults: Take 1 capsule 2-3 times daily on an empty stomach. When used as a sleep aid, full daily dose can be taken at bedtime. Cautions and Warnings: Consult a health care practitioner before use if you are pregnant or breastfeeding. Consult a health care practitioner if sleeplessness persists for more than 3 weeks (chronic insomnia) or if symptoms worsen or persist. Consumption with alcohol, other medications, or health products with sedative properties is not recommended. One of my FAVOURITE supplements that I purchase regularly. Helps me sleep deeply & restfully and reduces my anxiety naturally. I have it in tincture form as well, but tend to prefer the vegan-friendly capsules.